Talk about amazing! I think I have a new favorite cookie. So this past weekend I was asked to make a dessert for the funeral of a wonderful man in our church who had passed away. After scrolling through all the saved recipes in my recipe app, I decided to try these cookies…I mean who doesn’t love cookies AND s’mores?! Plus I had most of the ingredients. 😉 Well, we purchased the last few ingredients I needed after church Sunday night, then as I put Logan to bed, my wonderful husband Mike was brave enough to start on the cookies for me (he’s never made cookies before). The recipe said it would make 46 cookies, and of course we wanted some for ourselves, so I told him to double the batch. Ha! So you know how you usually mix the dry ingredients, then the wet, then you mix them together… this is what happened! In a mixing bowl whisk together oats, flour, graham cracker crumbs, baking powder, baking soda, cinnamon and salt for 30 seconds, set aside. In the bowl of an electric stand mixer fitted with the paddle attachment, whip butter, brown sugar and granulated sugar until pale and fluffy. Mix in eggs one at a time, blending until combined after each addition. Blend in milk and vanilla extract. With mixer set on low speed, slowly add in dry ingredients and blend just until combined. Cover bowl with plastic wrap and refrigerate 1 hour (or up to 4 hours). Preheat oven to 375 degrees. 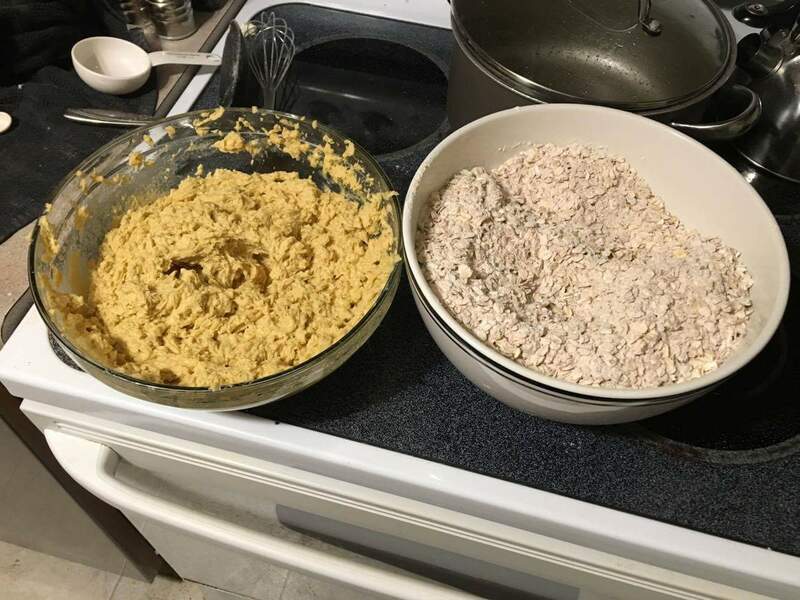 Remove cookie dough from refrigerator and scoop dough out by the rounded tablespoonfuls (about 26 grams each) and roll into a ball. Transfer to Silpat or parchment paper lined baking sheets, spacing cookies 2-inches apart. Flatten cookies slightly and bake in preheated oven 7 – 8 minutes (under-bake them just a tad as you’ll be returning them to the oven for about another minute). While cookies are baking, using scissors, cut marshmallows into halves and unwrap Hershey’s Kisses. Remove cookies from oven. Allow to cool 5 minutes (waiting 5 minutes is optional, it just seemed to help the marshmallow hold their shape a little better. Not a huge difference though). 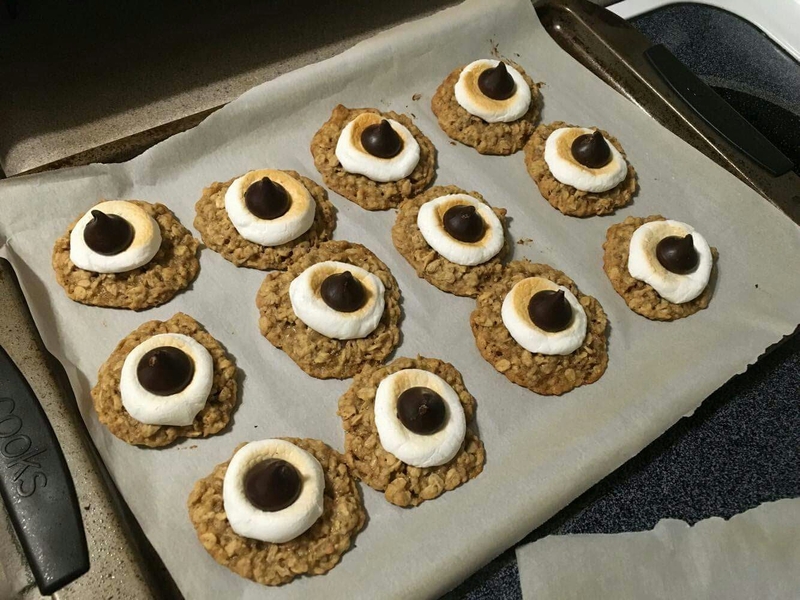 Top each cookie with a marshmallow (cut side facing downward). Heat oven broiler, place oven rack several levels below broiler element and transfer marshmallow topped cookies to oven (don’t take your eyes off of them, they’ll brown rather quickly), allow to broil about 1 minute (maybe less, maybe more). Remove from oven and gently press 1 kiss into the center of each toasted marshmallow. Serve warm or allow to cool and store in an airtight container.